From performance apparel and shoes to sleeping bags and backpacks, sustainability is demanded by consumers in the outdoor market. 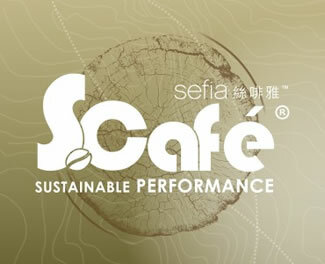 Sustainability is now as important as functional performance. The more sustainable the product, the better. Manufacturers and suppliers have responded by using bio-based and recycled materials; eliminating the use of harsh chemicals; blending renewable, biodegradable and carbon neutral plant and animal fibers; and reducing the use of water and energy. Transparency in all areas of sustainability is necessary throughout the supply chain, so that the product targeted toward the outdoor market are sustainably certified. Important independent global standards that are used in outdoor apparel industry includes: Oeko-tex®, bluesign®, and GOTS (Global Organic Textile Standard, which is the world's leading textile processing standard when it comes to organic fibers). The FabricLink Network looks at sustainability of several companies at ORSM 2018 that have made this a key focus of their product development and production. Microban's new Scentry Revive® odor control solution permeates the garment to form a protective barrier by neutralizing odors for up to five wears without washing for clothing, and up to a year without washing for footwear. Even without washing after each use, the Scentry Revive® barrier prevents odor and odor build-up over the life of the fabric, allowing consumers to "Live More, and Wash Less". Scentry Revive® is ideal for infrequently washed products such as gear, gym bags, uniforms, mattress pads and bedding. 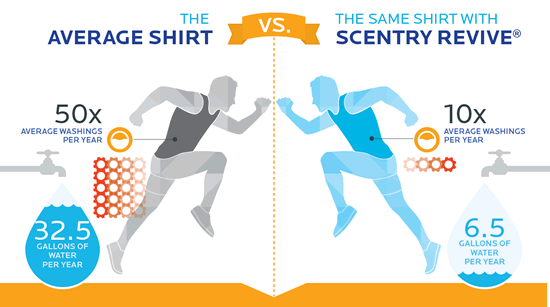 One garment treated with Scentry Revive® can save 75 lbs. of greenhouse gas per year, 219 bottles of water per year, and $125 in apparel costs. The technology continues to neutralize odors for up to 50 home launderings. Singtex Industrial Company, Ltd., a Taiwan based company, showcased its line of eco-friendly stretch fabrics at ORSM'18. Since its establishment in 1989, Singtex has invested heavily into the creation of innovative R&D processes to position the company as a key supplier of sustainable, eco-friendly textiles for major clothing brands. Singtex's new mechanical stretch fabric is made with a thermoplastic-engineered polymer and side-by-side bi-component fibers, all in a variety of options and price points. Although the fabric has similar stretch qualities to elastane, the Singtex stretch fabrics possess better breathability, are faster drying, have enhanced durability, and are friendlier to the environment than comparable elastane or spandex fibers, which are non-biodegradable. water consumption, and less CO2. Tex-Ray Industrial Company, Ltd., a Taiwan based company, featured its functional and sustainable natural-fiber, blended fabric collection, developed with the help of advanced, proprietary technology. By blending with natural fibers such as wool, linen, or cotton, TexRay has reduced the use of polyester in its fabrics. Recently, the company has also adjusted its global operational structure by integrating its yarn dyeing, fabric and garment production into a completely vertical manufacturing process. This change has actively established continuous production from fabric to clothing, and increased the development of innovative products that satisfy various climates, functions, and environmental protections. Chemours launched its latest innovation, Zelan™ R2 PLUS, which expands its commercial product offerings of non-fluorinated DWR products. 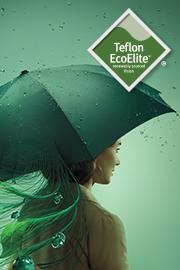 Zelan™ R2 PLUS contains 30% renewably sourced plant-based raw materials, and is focused on delivering a high level of durable water repellency for all substrates. The raw materials used in Zelan™ products are not derived from food-sources and are non-genetically modified. Work is also underway in the development of other non-fluorinated offerings to provide additional stain release benefits. These renewably sourced finishes help brands in minimizing the environmental impact of the textile supply chain. Chemours' growing portfolio of the Teflon brand of non-fluorinated and renewably sourced technologies compliments its existing Teflon™ fabric protector portfolio of products.